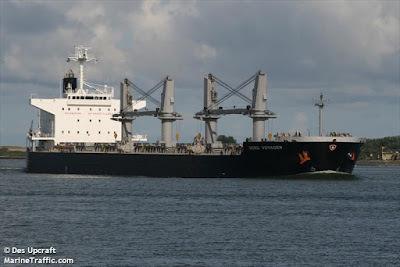 The Amver participating bulk carrier Nord Voyager rescued two sailors from the disabled sailboat Sailfish approximately 670 miles south west of the Galapagos Islands on Monday, June 15, 2015. U.S. Coast Guard rescue personnel in Alameda, Calf. received a telephone call from a family member of two sailors reporting their boat was demasted and in distress. Within minutes of receiving the phone call, rescue personnel also received a 406 MHz Emergency Position Indicating Radio Beacon (EPIRB) alert for the same location. Coast Guard authorities immediately queried the Amver system and located the Panamanian flagged bulk carrier Nord Voyager which was only 130 miles away from the sailboat. The crew of the disabled sailboat maintained two hour communications with rescue personnel. The master of the Sailfish also released his mas and boom from the boat to increase stability. The crew of the sailboat reported the on scene weather was 12 knot winds with eight foot southerly swells and clear skies. The Sailfish crew members were encouraged to take turns sleeping while the 620-foot Amver ship made best speed to their location. Once in the area the crew of the Nord Voyager were able to safely embark the two survivors without injury. The sailboat was marked and left adrift. 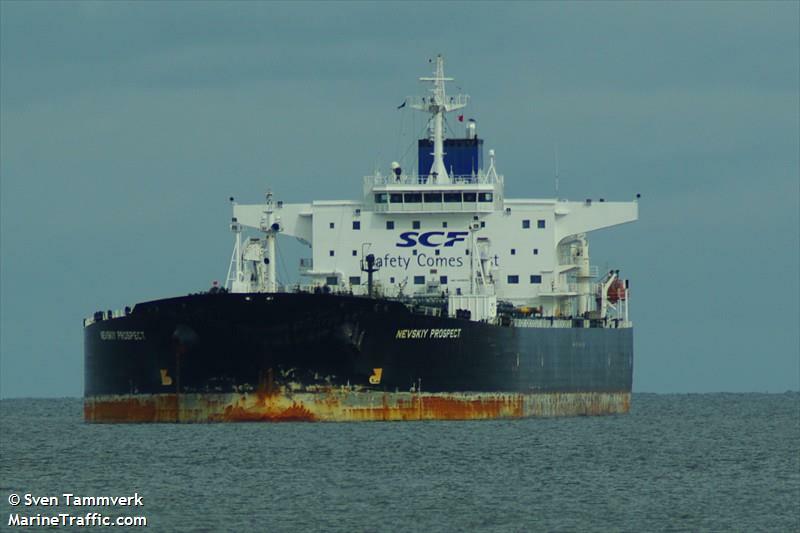 The two survivors will remain aboard the Panamanian flagged ship until it reaches its next port in Vitoria, Brazil on July 3, 2015. The Nord Voyager, managed by IMECS of Japan, enrolled in Amver on March 25, 2012 and has earned one Amver participation award. The Amver participating tanker Nevskiy Prospect provided medication to an ill French sailor in the Atlantic on Tuesday, June 9, 2015. Rescue personnel at MRCC Gris-Nez reported a 35 year old female aboard 43-foot sailboat sailing from the Caribbean to France was experiencing a medical issue and requested antibiotics and a doctor. U.S. Coast Guard rescue authorities assisted by running an Amver Surface Picture (SURPIC) and locating the Russian tanker Nevskiy Prospect. The crew of the Liberian flagged tanker agreed to divert and provide assistance. "Please be advised that on 10 June 15 required medicines was send to sailing vessel. We will resume our voyage," captain Alexey Kozlov of the Nevskiy Prospect reported to Coast Guard officials. The crew of the sail boat confirmed they received the medicines and were continuing towards the Azores. The sailors said they would remain in contact with MRCC Gris-Nez. The 820-foot tanker Nevskiy Prospect, an Amver participant since July 29, 2007 and managed by Unicom Management Services of Saint Petersburg, Russia, has earned four Amver participation awards. Did you know you can enroll in Amver at any time? 24 hours a day, seven days a week. The entire enrollment process takes about 3 minutes per vessel. It isn't a burdensome task or a big deal. Well, unless you're one of the thousands of people a day in distress around the world. Then Amver participation is a big deal. Help us make sure no call for help goes un answered. Who joined Amver this week? You won't find this list anywhere else. If you want to know who joined Amver, who helped raise the bar for safety you'll find it here. Help us welcome the latest members of the Amver safety network. The Amver participating Maine Maritime Academy training ship State of Maine rescued a lone sailor after his sailboat began taking on water 520 miles southeast of Halifax, Canada on Wednesday, June 10, 2015. U.S. Coast Guard rescue authorities in Boston, Mass. received an alert from a satellite provider stating "Broaching, taking on water in heavy seas. Hove to!". The Coast Guard issued an urgent marine broadcast to all available ships and queried the Amver system to see what commercial ships might be near the stricken yachtsman. Rescue authorities also launched a search and rescue aircraft from Canada and Coast Guard Air station Elizabeth City. The Training Ship State of Maine, a 500-foot training vessel from the Maine Maritime Academy, was only 29 miles away from the distress location and agreed to divert and assist the sailor. The sailor, aboard the sailing vessel Prodigal, was on a voyage from South Carolina to Ireland when he encountered rough weather which damaged his sailboat. According to a press release from the Maine Maritime Academy the sailboat was damaged but able to come alongside the training ship. Cadets aboard the ship readied rescue equipment, fast rescue boats and rigged a jacob's ladder to allow the sailor to board the ship. Within a few hours of the initial notification the survivor was safely aboard the training ship, had called his family and was enjoying a hot meal. The State of Maine enrolled in Amver on June 24, 1998. The Maine Maritime Academy's Commandant of Midshipmen, Nate Gandy, said is best in the school's press release, "Students today got a first-hand look at a near disaster." Thankfully all the pieces of a successful rescue were in place. A robust search and rescue system that includes Amver, a well prepared sailor and seafarers willing to risk life and profit so that no call for help goes unanswered. It has been a busy week at Amver. We attended Amver award ceremonies in the United States, Norway and the Chamber of Shipping of America safety awards in New Orleans. We're so happy to promote the good work done by seafarers in the name of safety. You can help by enrolling in Amver. Here is the list of ships that joined us this week. While we're in Oslo attending NorShipping 2015 we want to be sure to recognize the latest vessels to enroll in Amver. If you haven't considered joining, put aside your doubts and join today. 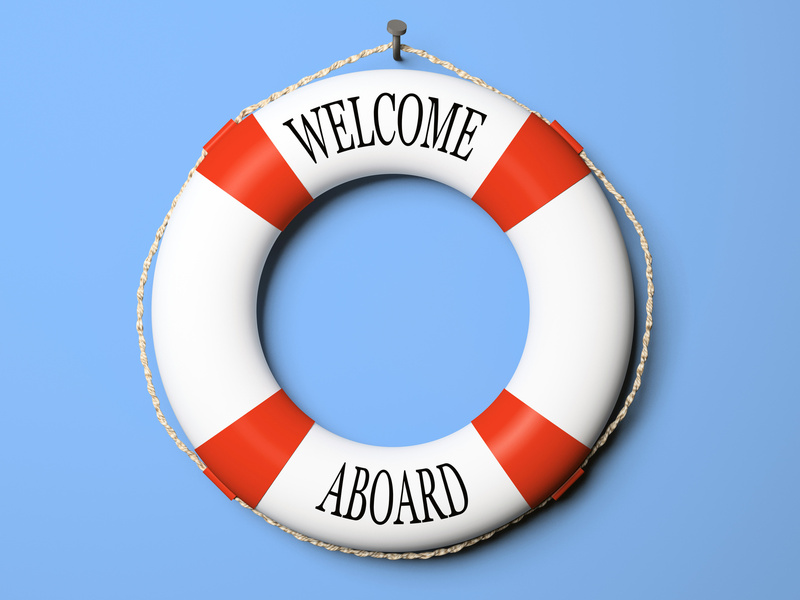 We look forward to mentioning your vessel in our weekly salute to new members! 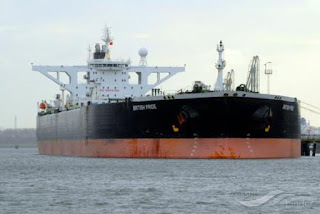 The Amver participating tanker Pride (ex British Pride) rescued seven sailors from their disabled speedboat approximately 230 miles west of El Salvador on Friday, May 8, 2015. Rescue personnel at U.S. Coast Guard Sector San Diego were notified by the 1,000-foot tanker they had encountered a 25-foot speedboat requesting water and fuel. The Pride did not have gasoline on board to transfer to the distress vessel but did provide water, food and some diesel fuel. The captain of the Pride then notified rescue personnel the sailors on the small boat were requesting additional assistance. Once the intentions of the sailors was determined the crew of the Pride safely embarked them and reported their conditions to rescue authorities in Panama. "We have rescued all seven members of the crew and there is no report of any missing persons," reported Pride captain LeBlond. "We attempted to raise the boat but were unable to do so because the hook on our crane failed," the captain added. The crew of the Pride transferred the survivors to Panamanian authorities when they arrived on May 12, 2015. The Pride, managed by Bernhard Schulte Shipmanagement Cyprus, enrolled in Amver on November 22, 2000 and has earned 15 Amver participation awards.